Diagrams of section and plan of an Egyptian tomb and super-structure (mastaba) of the Pyramid Age. P. - Burial shaft filled with rubble. 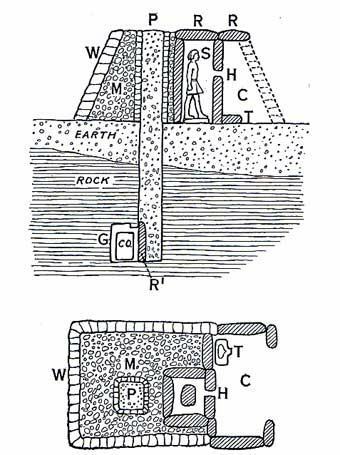 M. - Rubble mound of the mastaba, enclosed by a stone retaining wall (W). C. - The court of offerings, surrounded and roofed by slabs of stone ®. S. - A chamber (serdab) made of large slabs of stone, and containging a statue of the deceased. The large slab (H) is perforated to permit communication to be made between the statue and the court of offerings. T. - Table of offerings.